The All-Star Game isn’t over until we say so. Scott files the last word on the Thrilla in Ottawa. And Scott is an All-Star himself, a fiesty center for a NYC team, the Scapegoats. I figured since “my guy,” Rangers’ forward Marian Gaborik, won the MVP award at this year’s NHL All Star Game, perhaps I should say something about the event. The NHL All Star Game does not tend to be an exciting event. The game itself is a diet version of an average hockey game. There is little to no checking involved since no one wants to get hurt over this meaningless game (as opposed to the MLB ASG in which the winning conference gets home field advantage during the championship game at the end of the season). It is a high scoring game but that is more due to the lack of physicality, as I just mentioned, which then lends to the goalies not having as much of a chance of stopping the puck. So the high scoring is a result of an overwhelming advantage for the players and not so much a result of “exciting play.” Players due make an attempt to showcase their talent during the game but in my opinion I believe the Skills Competition is where we really get to see the stars’ abilities on display. 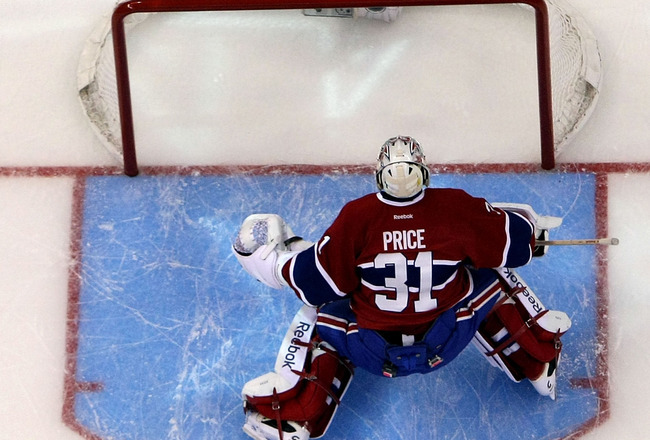 I approached the 2012 NHL All Star Game with a bit of dismay and disinterest. I have been disappointed in particular the last couple of All Star Games due to the fact the Sidney Crosby was not able to attend them. This year would unfortunately be another year without Crosby at the ASG as a result of the return of his post-concussion symptoms some weeks back. 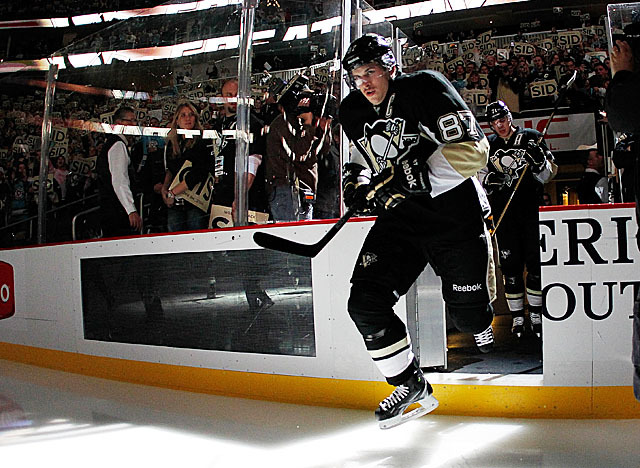 However, this year not only would Sidney Crosby be missing the ASG but Alexander Ovechkin would be out as well. Ovi decided he did not want to participate in the ASG in response to the league leveling him a 3-game suspension for a hit he made during a game. Not to get into this topic too much, but personally I feel he was right for opting out of it. First off the ASG is supposed to be a fun break for the players from their normal schedule. If Ovi would have went he would undoubtedly been bombarded by the media about the suspension and what was supposed to be a fun weekend would have turned into a migraine. 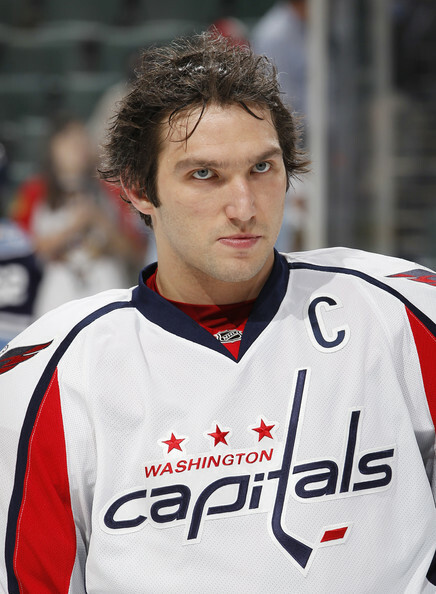 Second, what does Ovi miss out on not going to the ASG? The un-competitive game that does not have any meaningful gain from winning? The media circus and constant pressure they create (again for a meaningless game)? I do realize that I am going on giving excuses for how lame the ASG is and why it was alright for Ovi to skip it, while at the same time starting this chatter by saying that his absence was making me less interested in the ASG (meaning his absence would be having an impact). So while I do feel Ovi was in his right to choose not to go I will admit it did have a negative impact on the ASG. And the reason for that is because Ovi has been one of the main attractions at the ASG. His antics during the Skills Competition (such as putting on the straw hat and using 2 sticks during the breakaway competition) and his celebrity-personality are great attractions for this venue. Without him (and Crosby) I thought the ASG would lack greatly in entertainment. I believe the Skills Competition is the real showcase of the NHL All Star Game (and not the game). We get to see star players compete against each other using the skills that make them stars. Those that are great at speed, race each other. Those that are excellent “snipers” test their abilities in the Accuracy Competition. Etc. While there is plenty of humor and showmanship taking place during the Skills Competition, you can tell that they really are trying their best to excel at the skill they are competing to be the best in. The 2012 NHL All Star Skills Competition was a surprise hit for me, even without Ovi (or Crosby) and that is because others stepped up to the plate and put on a good show. Two rookies bested the veterans in the Fastest Skater Competition. Zdeno Chara destroyed his previous record in the Hardest Shot Competition by blasting the puck at 108.8 mph (previously it was 105.9). But what really impressed me was the Breakaway Challenge. 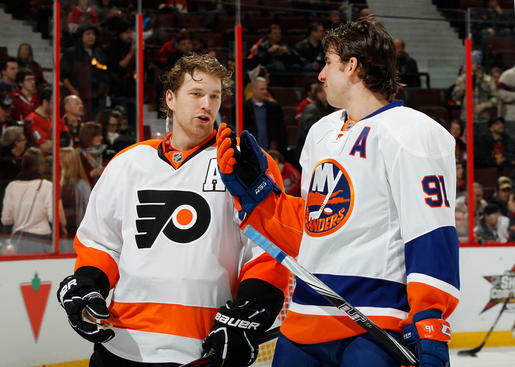 John Tavares and Sean Couturier displayed some magic with their abilities to control the puck. The goalies (Carey Price and Brian Elliott) had fun trying to throw off the shooters by acting unusually, such as jumping around and waving their arms, covering their masks, or facing the wrong way. Corey Perry was entertaining by skating about five feet in, stopping, throwing his gloves and stick away, and then pulling out a mini-goalie stick with which he skated in on the goalie low and scoring. But the player who really stepped up to the plate and “knocked it out of the ballpark” was Patrick Kane. 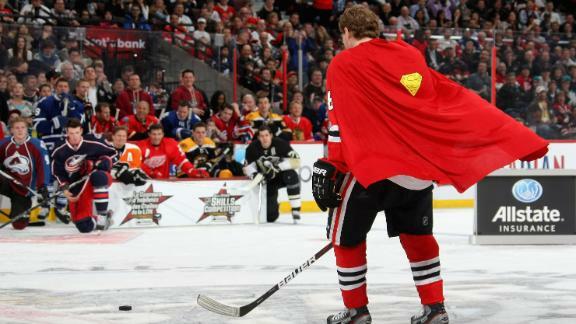 On his second attempt he donned a Superman cape and Clark Kent glasses and then proceeded to skate down the ice, purposely fall to go into a slide (as if flying), and then, using his hand, threw the puck onto his stick to knock the puck in to the net. On his third attempt, still wearing the cape and glasses, he skated in and took a slap shot at a puck that exploded into three pieces, demonstrating his “super” strength. The majority of fans agreed with me on this and voted Kane the winner of the Breakaway Challenge. The Skills Competition did not disappoint. So, while this year’s NHL All Star Game may not have featured THE players that would usually steal the show, the players who participated shined bright and proved why we call them Stars. See you in Columbus! This entry was posted in New York Rangers and tagged All Star Game, No Ovi No Sid. Bookmark the permalink. Hold the phone. Since when are the Scapegoats in the GHA? False advertising, Scotty…ahem. I think it is more of mis-communication. When I told them I didn’t play on the Boxers or Polar Bears but rather on the Scapegoats, I thought they knew that the Scapegoats are not a GHA team. My bad i guess. it was like that when i got here..